As you know, Scott goes to the Sand Dunes at Little Sahara, UT about 15 times a year. We used to go to the riding together when we were a carefree couple, without kids. But, now that we are a family of 4, I don't like to take the time away from the girls and I'm a bit frightened of getting hurt and leaving them without a mom, so I don't go with him. Saturday November 7th, was the first time I've been back to Little Sahara, since Jade was 4 months old. 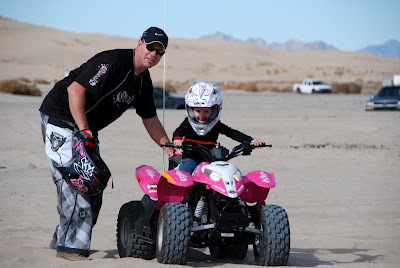 I loved our outing with our girls and loved getting to enjoy the great big dunes of Delta. We went with the Johnson family and 3 of their friends. 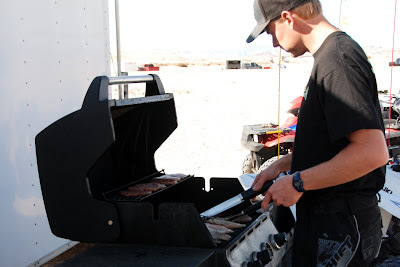 It was fun creating a circle of cars and trailers, setting up a canopy, lighting a fire and cooking on a grill. 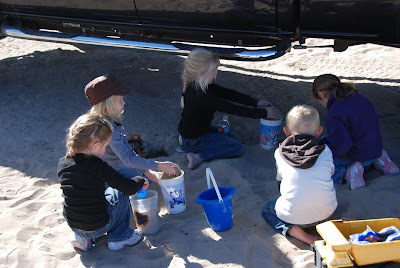 The kids had a blast riding around the camp on the little four-wheeler and playing in the sand. Plus the weather was amazing. Scott commented that we could go the next 20 years on November 7th and never have as good of weather as we did. It was short sleeve weather most of the day. As the sun started to set, the sweatshirts came out, but that was it. No need for hot cocoa, thermals or jackets. The only downside of the great weather were the crowds. There were people nearly every where you looked. Because there were so many people, we saw an ambulance and a helicopter. Which means the sign entering Little Sahara shows zero days since the last injury. As soon as we got there, we did an easy ride to the left of Sand Mountain. We took it slow and kept the caravan of about 10 quads together. The worst thing that happened was a broken flag from being kicked on a dismount. Everyone was able to get where we needed and everyone had a great time. After the first ride, we gathered and ate and ate and ate. With full bellies and kids full of sand, 5 of us decided to ride out to the infamous rock. 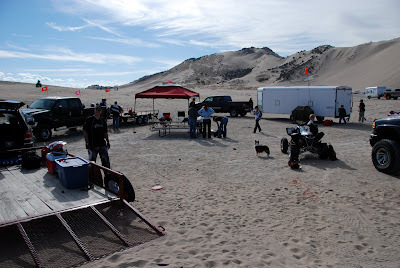 The remaining riders stayed at camp and did some training rides on the smaller dunes. The ride out to the rock was beautiful. The sun was just setting on our way back and the shadows of the dunes was absolutely breath taking. It reminded me of some rides we used to do as a couple. The guys got to shoot some of the tall hills and speed around some of the bowls. And Jade got to roll down some of the monster hills. Her shoes were full of sand and so were her pockets, but she was in heaven. After a great day at the dunes, I'm looking forward to next spring when we can take the girls down again and enjoy Sand Mountain and the Rock. This looks like a very fun day. Jade and Ivy are in their element when they get to be outside and have adventures with Mom and Dad-- Even better when there are more kids around. You were smart to take advantage of the spectacular weather!